Like his heroine, O'Neill knows how to tell a story. O'Neill writes with authority, blending fact, fiction and fable in this brilliant debut... a spirited and linguistic satire... I enjoyed this book immensely. It is so alive you can almost smell the air. O'Neill spins his own fantastic tales to match the original stories, packing his pages with vivid imagery, woven together with wit, philosophy, poetry, eroticism and memorable characters. The many twists and turns propel the story in a manner worthy of the novel's eponymous heroine; there are enough cliff-hangers here to satisfy the most jaded of readers... O'Neill absorbs his research into a novel of over 500 pages that never flaunts its learning. Scenes set in the teeming streets of Baghdad or during the sailors' punishing trek through the desert are especially vivid... This is a rousing read, and anything but pale. This is a remarkable and mysterious first novel, elegantly written and vividly characterised. Riffing on the Arabian Nights has been done before, but never with as much aplomb as here. As well as being a considerable piece of storytelling, this is a striking testament to the power of the imagination. Mastery of storytelling is its hallmark. He relates a thrilling, complicated quest. 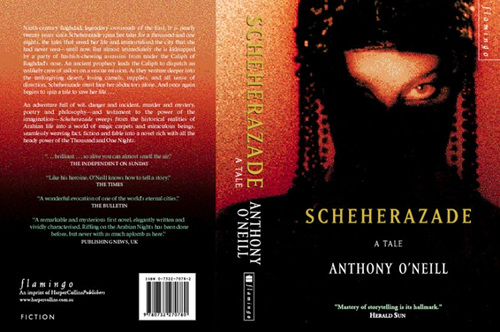 O’Neill is boldly and rightly convinced of his power to engross us, and cheeky enough to add to Scheherazade’s tally of 1001 tales. Story is all in this novel, and at two different levels: at the visceral level of the seductive, suspenseful plot and at the theoretical level where the role and function and operation of the story are demonstrated and discussed … A prodigious and most enjoyable feat of the imagination. O’Neill mixes fact, fiction and fable into an exuberant, witty tale about magic, vengeance and the nature of storytelling. O'Neill's lovingly crafted debut novel stands head and shoulders above the current run of ancient historical novels. A bewitching tale, rich in magic, mystery and adventure. [A] debut novel of epic proportions. O’Neill expertly weaves together his characters’ stories, providing colourful descriptions of a time and place immortalised through stories and legends, and questions the very essence of storytelling along the way.